Hi Mark, the new grill for my A8 is now painted and installed. I did not cut out the center areas of the fog light grills as the blades on both sides of the grills need to be retained. I instead painted the fog light grills gloss black and relocated the license plate to the right side. Everyone loves the looks of the new grill. It's taken a classy looking car and transformed it into a luxury sports car. Thanks, it was a great purchase, l received it one day after l ordered it, and the fitment was good. I did pre-drill the new mounting holes as the first self tapping screws snapped off. I've include a couple of the pre and post pic's. Slideshow below will provide variations in paint, lighting, and grille options. Example above shows RS silver grille, fully painted lower bumper lip, oem corner vents, LED's not installed. Aftermarket bumper for the facelift now; shown here with optional rings & optional corner grilles. 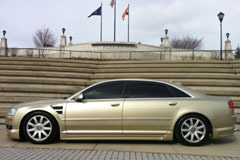 The new UberHaus RS Sabre bumper for the Audi A8 D3 years 2006 - 2010, is coming down the pike. This is the bumper upgrade you've been waiting for that bumps a D3 up 1 generation. LLTeK announces a no-charge upgrade in its A8 / S8 D3 Sabre bumper programme. As part of the package, lower vent LED /DRL's are included, and these lights have now been upgraded to a larger, brighter performance product. This bumper provides a clean, factory RS look. 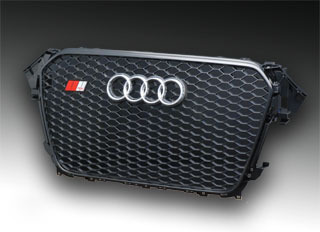 The Quantum RS grill, a central feature, presents a no-license-plate-panel / ultra-clean appearance featuring OEM RS style honeycomb mesh seen on all Audi RS cars. 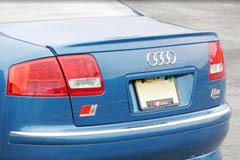 However, a euro-spec license frame for a plate can be neatly attached if required. 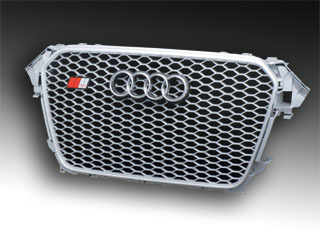 Style enthusiasts can choose between Audi's square shoulder black or silver RS look grille. Orders for Europe or other countries that require a Euro-style plate can have the same black or silver RS Quantum grill version with a fixed Euro-sized plate holder. The bumper accepts all 4 park distance sensors. If your car does not have sensors, a delete option is available at no cost. Designed in Spain and built in Portugal, the Sabre is the absolute latest in Audi A8 styling with delivery set for late summer 2013. Ask any question you have here via e-mail. The photos of the Sabre bumper below (see Features We Like) are advanced development pictures received from Portugal. So, to give you a better idea of the finished look, we are providing photos of other Audi RS cars to give you the look and feel of what the bumper will look like and will provide new photos of the bumper on and off the car as the project moves forward. Sabre RS bumper includes choice of RS grille in Piano Black (left) or RS Silver (right with) rings optional. 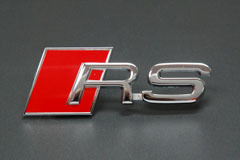 RS Silver grille illustrated with bigger brighter LED upgrade. In North America call toll-free 1 888 465 5835 --- International 001 514 733 6333.
Business hours are 8:30 AM to 5:00 PM ET - International calls -5:00 GMT. Simple installation - the Sabre is a true bolt-on. True RS design in the Audi tradition. Choose Piano Black Glossy RS Grill or Gunmetal Silver Grill. Upgrade to RS corner grill set optional. Note: *Shipping price is a manufacturer subsidized price for locations within the USA (except Hawaii & Alaska extra) plus Canada. In case of product return, $299 in imputed shipping costs is non-refundable. to accomodate AAC must be accomplished locally. 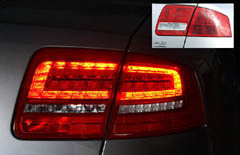 Few North American A8/S8 D3 cars have this option. All offers, programs and pricing subject to change. Roof spoiler available in 2 sizes - XT 6" and ST 4"
Here are the styling cues the Spanish design team were working with in developing the A8 D3 Sabre.